These days subscription boxes are in top. Everyday I come to some new subscription box and it's not a joke. There are so many options available now which obviously confuse us sometimes.. I am very choosy while selecting any new subscription box. 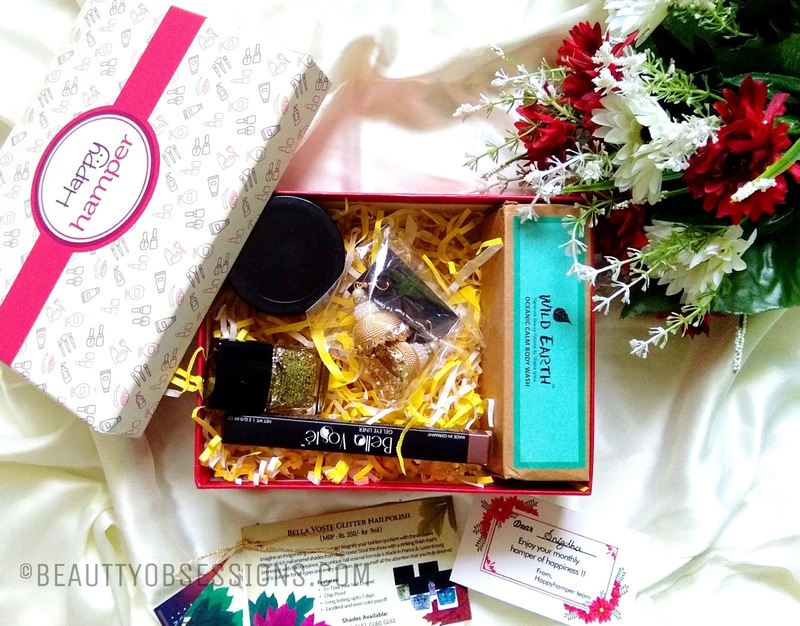 Recently I came across a new subscription box named 'Happy Hamper'. The name itself is so cute, isn't it? I visited the website to see its offer and price and love it on the first sight. The team has named the November box as #BringItBack where they have added some popular products of last months boxes. The thing I appreciate more is, you have the freedom to choose products according to your choice and curate your own box. The basic hamper has two products i.e. Mcaffeine smooth jazz caffeine body butter (399/-) and Bella Voste gel eyeliner (399/-) which priced at Rs437/- . Then if you want to add more products into your box, you can choose from the given options makeup, skincare, haircare, etc. The respective price of each product you add into your box will add to your total price... Even there is also discounts on the original price. I like the concept, don't you? Here is my own curated happy hamper box. The first thing is, the front face of the box is so funfull and happy-happy kind.. The box is really sturdy and can be reusable. I am going to store my makeup inside it.. Now see what all I have chosen for myself.. 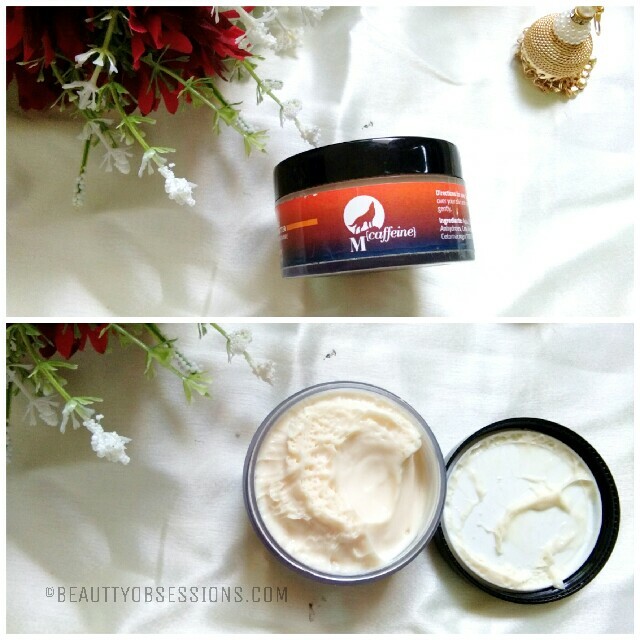 This brand is so new to me but I am loving this body butter from the first use only. It looks creamy and smooth and really effective to its performance. 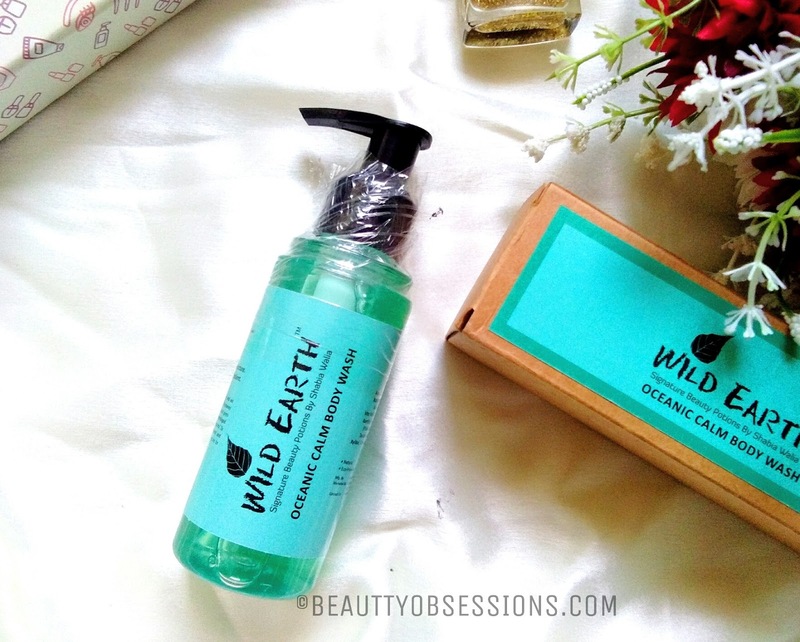 It has no paraben... Will review in detail very soon. I haven't tried any Bella Voste product yet but have heard good reviews on them... Luckily got the gel liner in this box. This is a dark brown shade. 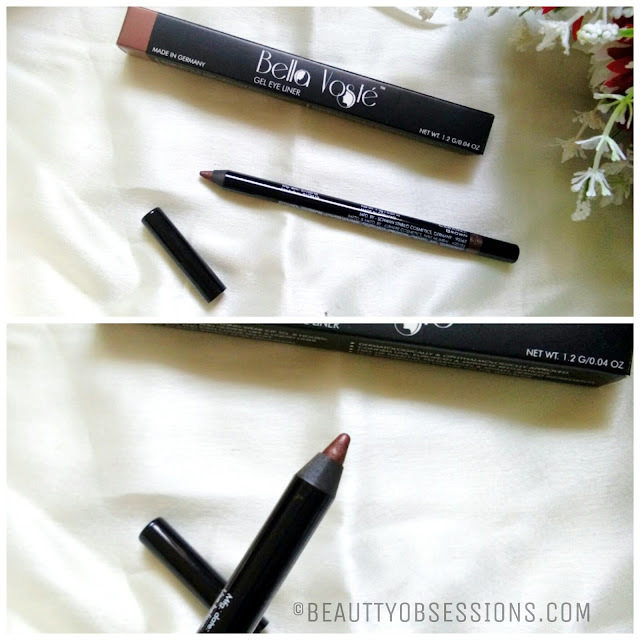 It has creamy texture and well pigmented. It has fine shimmers in it which adds shine and drama to eyes.. Again detailed review is coming soon..
Again another Bella Voste product and I choose it by myself. Being a nail junky how can I miss any nail product . 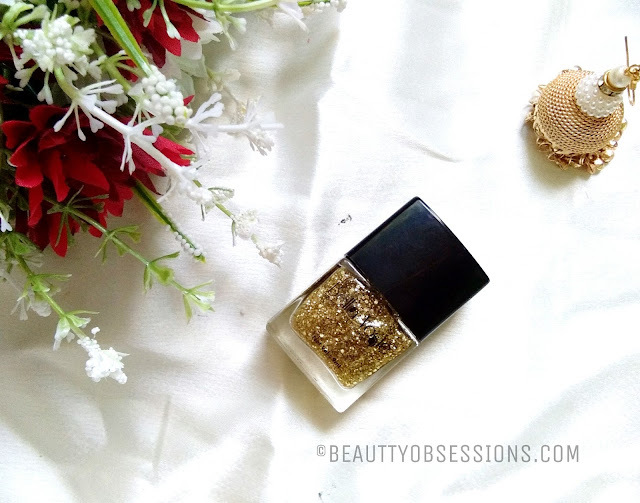 I was searching for a golden glitter polish since long and got here in the box. The texture and consistency seems perfect. There are so many glitters in different shapes and is perfect to give a nice bling nails.. I am yet to apply this.. I will definitely write a blog on how to apply glitter polish in the right way using this Bella Voste polish. This brand is also need to me but the claims tempted me to get it. This is sulphate and paraben free. This has all natural ingredients.. I am super excited to try this out. Will also post a detailed review on this. 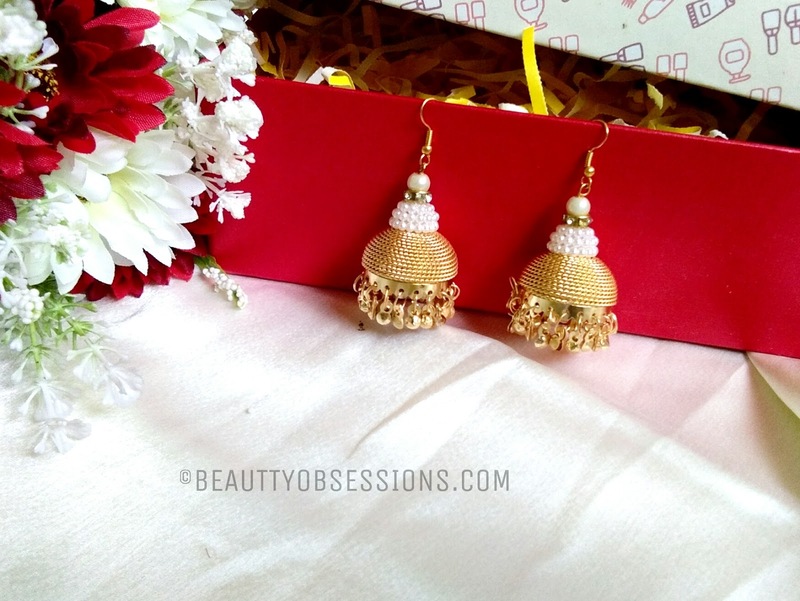 These pair of golden jhumkis are the surprise in the box... The quality is so good and it is very traditional too. I love it. So there are products worth Rs1400/- inside the box which costed me only Rs620/- .. I think this is a best deal to have.. What say? You can book your November Happy Hamper HERE. Don't forget to use the coupon code HAPPYSNIGDHA5 to avail extra 5% off on your box.. I must say this box lives up to its name...each product gives such cheery vibes...loved all of them! Waoh all the products are so useful . 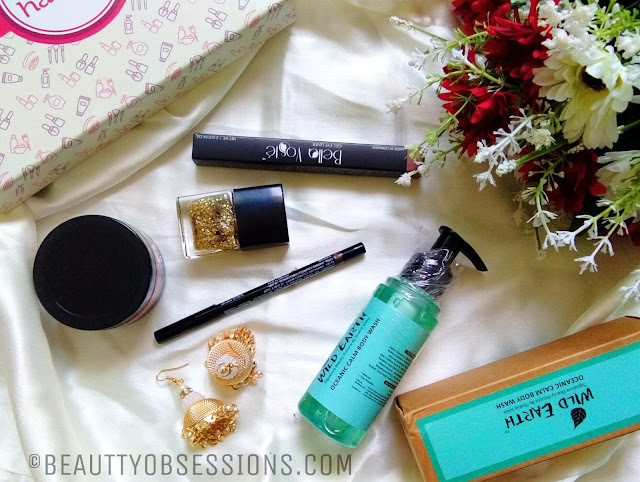 I love this Month's happy hamper.. loved your detailed review.